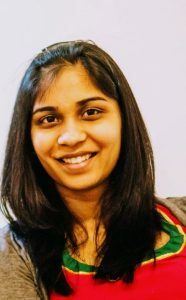 Swathi Baskaran grew up in Southern India. She completed her degree in Horticulture and Psychology, after which she served at the Baha’i World Centre in Israel for 7 years. Swathi met David Twaddell during her service in the Holy Land, and they were able to join their lives together. They have two beautiful children born in 2012 and 2014, who spent their early years in the shadow of the Holy Shrines. The couple now lives in Cleveland Heights, Ohio, in the United States. Upon the birth of her first son, Swathi turned her attention to the important role of primary caregiver of Aarav and later, Aarya. As their children grew older, Swathi started to work in the field of education. She began to serve as a guide and mentor to children by helping them build confidence and engaging them in activities working with them. Swathi also trained in Montessori teaching and started to apply her knowledge at home with her children. This learning also helped her gain an understanding of her children’s growing needs. During her service at the World Centre, Swathi also performed the tasks of developing and implementing educational activities as well as recreational programs for young children. She served as a children’s class teacher for 3 and 4 year olds. She also helped setup virtue activities and activities based on Montessori principles and concepts. During this process, she ensures that children are not forced and allowed to learn at their own pace. She is now a substitute teacher at her children’s Montessori school. Swathi is serving as lead faculty for Parenting courses and working collaboratively with the Relationship and Marriage faculty team.